Your smartphone is going to get stolen, and whether the culprits are a pack of well-meaning pranksters or police officers breaking up a peaceful protest, you'll want to ensure that your private data is safe. No kind of encryption is foolproof, but taking a few moments to implement these simple tips will go a long way towards making sure your personal data remains secure when the trouble starts. Most modern Android phones do not have data encryption built into the hardware, which means that you'll have to rely on third-party apps to secure your text messages, e-mail, and other critical communications. 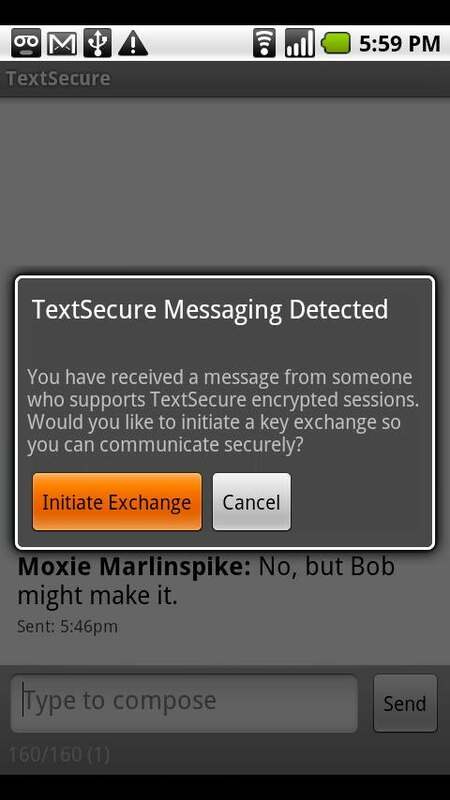 Encryption on Android (Nexus S and Nexus One phones) via the TextSecure app. Thankfully, you have plenty of options; one of the most promising is WhisperCore, a smartphone encryption app from Whisper Systems that can encrypt your phone’s flash memory and even create encrypted backups in case your phone falls into the wrong hands and you have to perform an emergency data wipe. The app is still in beta and works only with Nexus S and Nexus One phones, but hopefully the Whisper team is working hard to extend this awesome app to cover more hardware. Alternatively, Android owners can selectively encrypt specific files and folders on their phones using apps like Droid Crypt ($2.89) or AnDisk Encryption ($3.99). Both of these apps allow users to encrypt images and documents stored on their smartphones using 128-bit AES encryption, which should buy you some time if someone manages to crack your password and start rooting through your phone. Even better, a handful of Android apps currently in development (that is, they're in beta) can encrypt your outgoing phone calls and text messages in real time. Our favorite of these communication encryption apps include RedPhone and TextSecure, which are also from Whisper Systems. RedPhone will automatically encrypt your phone calls, making it more difficult for anyone to listen in, while TextSecure is a text messaging app that automatically encrypts all text conversations between you and other TextSecure users and stores all your text messages in an encrypted database. 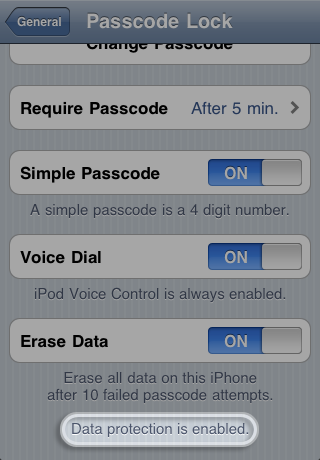 Enable the Passcode Lock feature of iOS 5. It’s practically impossible to fully encrypt your iPhone, but you can significantly improve your smartphone security by updating to iOS 5 and enabling the Passcode Lock feature in the General section of your Settings menu. With iOS 5, your outgoing iMessages should be encrypted, and most modern Apple devices--including all iPads and all iPhones since the iPhone 3GS--have limited data protection built into the hardware, which encrypts some of your data with a unique key generated from your passcode. You can make sure this encryption is working by verifying that the Data Protection feature in your Passcode Lock menu is enabled. Not many data encryption apps are available for iOS, but you can download voice encryption apps like Kryptos or Cellcrypt to encrypt your outgoing phone calls. Use text encryption apps like Encrypt SMS ($0.99) to keep your text messages secure, and consider picking up the (somewhat pricey) SecuMail app ($49.99) to allow you to send and receive email encrypted using the OpenPGP standard. Apple also provides built-in tools that allow you to remotely wipe your iPhone and ensure that nobody can steal your personal data if your phone is lost or stolen. To use those tools, first turn on the “Find My iPhone” feature and make sure that remote data wipe is enabled; then log in to MobileMe from your PC and select “Wipe All Data” on the device you've picked. If you have the Siri voice command feature enabled on your iPhone, be aware that it's possible for pranksters and thieves to send texts and email from your locked iPhone by holding down the Home button and dictating messages to Siri. To secure your smartphone against unauthorized Siri use, simply ensure that the "Siri" option in your iPhone Passcode Lock menu is switched off; this will prevent Siri access on your locked iPhone 4S. Some of these security measures may seem like overkill, but don't forget that our smartphones usually carry some of our most prized personal data, including credit card numbers and financial records. A strong password and reliable encryption are a one-two combination that will ensure your smartphone and the valuable data it contains are secured against unwanted use or intrusion.